The Dine food jar is essential for packing meals on the go. Dine has insulated walls to keep meals hot or cold for hours, while its durable exterior will remain cool to the touch. It's the ideal meal companion. ZoLi is a USA based company started in 2008 with the goal to create safe, innovative products that meet the challenges of modern parenting. Over the years, as the company has grown and their product line has expanded, they have broadened their focus from modern parenting to everyday life. However, their core vision remains the same - to provide innovative and safe solutions. ZoLi products are designed in the US and manufactured in China or Taiwan. All factories are carefully screened and regularly visited to ensure that products are made in safe and responsible working conditions. 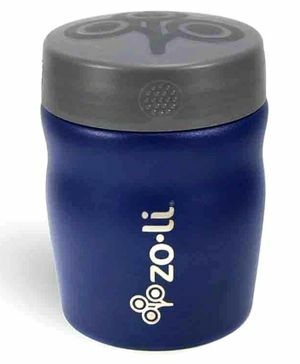 ZoLi has been launched in India by Maiden Distributors Limited in 2018. "Great quality ! Easy to use"